Medium: lithograph (after the decoupage). Catalogue reference: Duthuit 101. 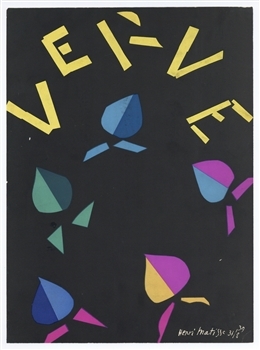 Matisse executed this composition in 1940 especially for the front cover of Verve (number 8). Sheet size: 13 3/4 x 10 inches (350 x 256 mm); there are no margins (photographed here against a white background). Signed in the plate (not by hand). Condition: there is wear and soiling.